HOW TO LIGHT THE FIRE? 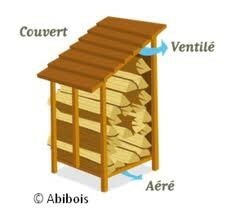 - Provide a roof that will not be in contact with the logs. The plastic sheet can be used if it does not fully sink the pile. Otherwise, a traditional sheet metal or roof is perfect. - Tilt the roof or tarp and provide a large overhang so that the condensation water that naturally emerges from the wood does not stagnate but the loss and the drop away from the pile. How much moisture should my wood have? It is important to note that wood which contains too much moisture does not produce heat and that the more moisture the wood contains the less warmth it will provide. Indeed, the heat output produced by wood during burning is not used to warm you, it is used to evaporate the water that it contains. Furthermore, humid wood increases carbon monoxide emissions by a factor of 2 to 4 compared with dry wood and encourages clogging of your appliance, in this way decreasing its efficiency. Which type of wood should I choose? Birch: Birch burns quickly without its flames becoming too hot and leaves very little ash. It produces attractive, slightly bluish flames. It is a wood liked by bakers. It produces good embers and is used for lighting the fire. 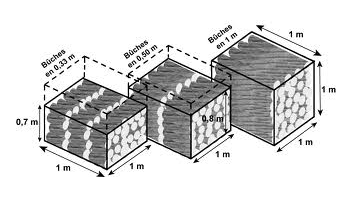 Beech: Beech is excellent firewood: it dries quickly and offers good heating power. For drying, it must be placed under a shelter as soon as it has been resawn so that it does not rot. It is a wood which burns quickly, so it is easy to light. It emits pleasant odours when burning. It is considered the idea firewood. It produces attractive flames and good embers. Oak: It burns very slowly. It has to be left for 1 year in the rain in order to remove all traces of tannin before being stored under shelter to dry. Oak produces the best embers. It burns slowly and produces a lot of heat. Hornbeam: Hornbeam burns slowly which results in a good amount of heat production. Not much smoke is produced when burning. Hornbeam produces excellent embers which distribute heat over time. The flames that it produces are attractive and uniform. Ash: Described as producing the most attractive flames, it is a wood which burns for a long time without projecting sparks and produces a large amount of heat. It is difficult to cut. Chestnut: Chestnut is a strong wood. It used to be used for manufacturing barrels. It is mediocre firewood because it explodes and produces a lot of sparks when burning. When the fireplace door is lowered, it can be used without risk; when the door is raised we recommend that you use a fire screen. Coniferous trees: Coniferous trees should not be used. This type of wood releases large amounts of heat but burns very quickly. When it burns it causes the projection of embers and the resins contained in the wood clog up the fireplaces and flues very quickly. These very large deposits of soot encourage fires to start in the flues.